I'm sure all of you know Nanette Lepore and her designs. 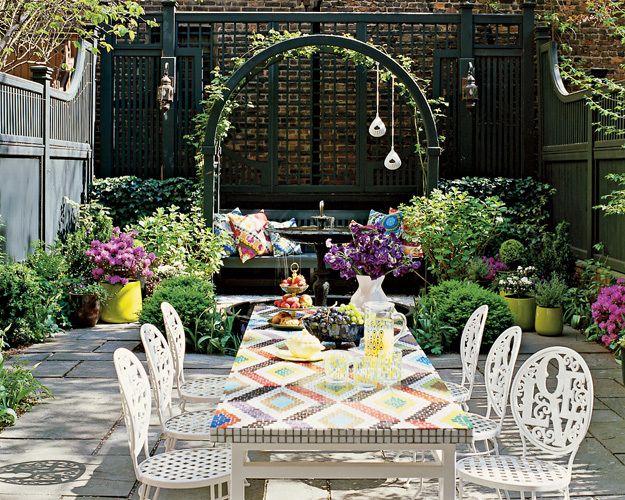 Well, today you'll get to take a peek into her unbelievable West Village townhouse. The space was designed by Jonathan Adler and contains what I consider the perfect balance between contemporary and mid-century style, splashed with a bit of boho-chic. It's true perfection in the middle of the West Village. A portrait of Eva Peron (a flea market find!) hangs over the fireplace in the living room. 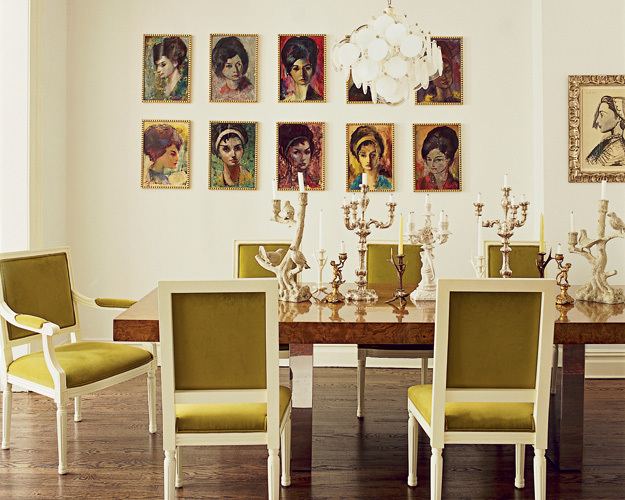 Louis XVI-style chairs surround the vintage dining table. Note: Fabulous vintage sconces in the master bedroom. And who can afford to have a private garden in the WV? Nanette. The table was designed by Adler. 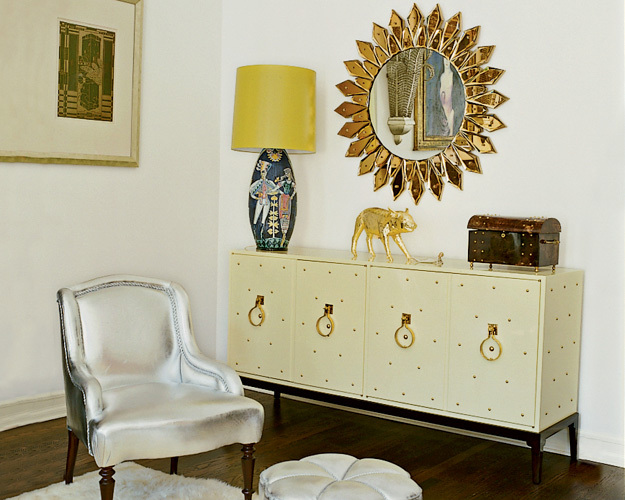 Swooning over this vintage cabinet. Even the toy poodle looks like decoration! Wall hanging is by Matthew Williamson for the Rug Company. Beyond stunning! I love analyzing the combination of elements in these rooms! Absolutely amazing. The vintage elements really balance all of the color and funkyness! STUNNING. seems muted for adler and i LOVE this side of him! Ummm, no words. Seriously amazing! Nanette Lepore is fantastic. I am just drooling over her closet! And that patio?! Divine! Unreal!! The colors are simply amazing...I don't know if I could be more jealous! 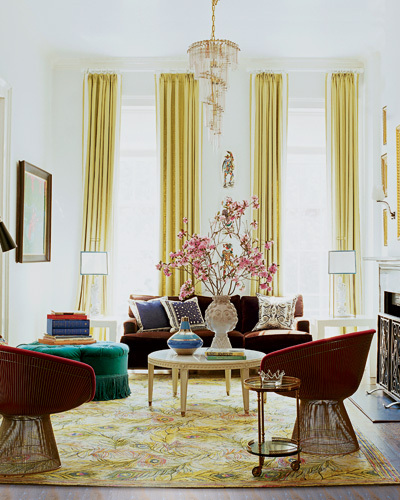 Love some of these rooms especially those with the loud pops of color. love the vintage buffet/cabinet, and all the bright colors! Definitely representative of Nanette Lepore! Have to say the plainest room, the hallway with the white console, is probably my favorite. Ack I want that portrait of Eva Peron! Lovely images, the colors are beautiful. Great images!! I just love that Peter Pan chandelier!! I ADORE NL's clothes........and Johnathan isn't too shabby himself. Absolutely wonderful, I mean a crystal ship shandy. Oh yesssssssssssss! wOW. That is all I can really say. I love everything about this house! Wow, did you see that ship chandelier? crazy!!! Love the cabinet and the sunburst mirror! Oh my, there are so many amazing things in this house! I guess that's what happens when you are Nanette Lepore and Jonathan Adler designs your home. These are all fabulous! Can I move in? Her living room is one of my favorites! I think JA did a great job - a more sedate, sophisticated scheme but still lots of color. Very chic! So beautiful! I love the color combinations. I dream to own a home decorated like this one day!! wow, I hadnt seen this, amazing! this is totally inspiring me to use more color in my home decor! that blue velvet pouf in the closet...love!! oh wow....unebllievable garden....so jealous - thanks for sharing! Love the closet with the poodle. So cute and elegant. Whole house inside, outside is gorgeous. All the pictures are amazing, stunning. Very well decorated and balanced house. Nice job!